European champions Barcelona will "fight" to stop the best players joining the Premier League, says the club's president Josep Maria Bartomeu. The Premier League's new £5.1bn television deal will give English clubs huge financial power from the 2016-17 season. But European champions Barcelona feel they can combat the threat. "We are going to fight against the Premier League. We want to have the best players in our league," Bartomeu told BBC Sport. "It's true that the Premier League right now is the best league competition in the world, not only in a sporting way but in terms of income too." In recent years, the Premier League's top players, including Gareth Bale and Luis Suarez, have moved to La Liga with Spanish clubs keeping their top stars. But the English league will get stronger from the new deal. Bartomeu said: "The new Premier League television rights contract is something that the rest of the leagues have to follow. "But no other club in the world has as big an income as Barcelona." Asked if that meant he would ever consider selling four-time world player of the year Lionel Messi, Bartomeu replied: "Ha. No, no, no, no." Bartomeu, 52, was elected last week to remain as Barcelona president for a six-year term. In leading one of the world's biggest clubs, who won an unprecedented second Treble of La Liga, Copa del Rey and Champions League last season, Bartomeu has a powerful voice within the game. And speaking to the English media before Barcelona's pre-season game with Manchester United in Santa Clara on Saturday, Bartomeu covered a range of issues. Can Barca get even better? "Last year was probably the best season in our history because we won everything. This year we have tried to work with the same team but also bring in some players who can give us a bit more competition for places, like Arda Turan and Aleix Vidal. "In our opinion, our team will be more competitive. This year we have six possible trophies - La Liga, Copa del Rey, Champions League, Spanish Super Cup, European Super Cup, World Club Cup - that we want to win. It's not going to be easy but we are going to try." Was buying Luis Suarez a risk? Uruguay striker Suarez moved from Liverpool to Barcelona in July 2014 for £75m. He scored 25 goals in 43 games. "It was not a gamble. We knew the player Suarez was. We had been following his progress since his time at Ajax. The first time we had the chance to bring him to Barcelona we tried and we were successful. "Suarez brought a surplus - something extra - that helped us to be the best soccer team last season." Will the Premier League's TV deal make it harder for Barca to attract top players? "The Premier League is a reference point. La Liga are learning a lot of things from them. We have a new law that obliges the clubs to sell all the TV rights jointly because we have to follow the Premier League. "Barcelona and Real Madrid are the biggest clubs but others like Atletico Madrid, Valencia, Sevilla or Athletic Bilbao are doing a nice job. "We want people to watch our competition, not only the Premier League. On an individual club basis, we know the competition is getting closer, not just with the Premier League but also Paris St-Germain and Bayern Munich." 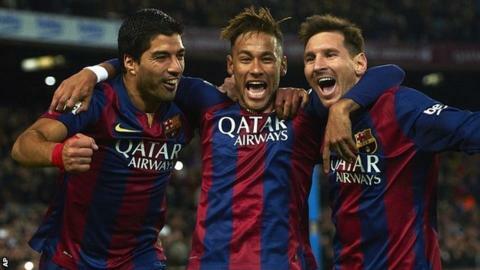 Barcelona's kit deal with Nike expires in 2018 and shirt sponsorship deal with Qatar Sports Development ends in 2016. Both are expected to lead to big increases in revenue. How do you view Manchester United? "They are one of the biggest clubs in the world. They have always been very successful and will be successful in the future. "We know their coach, Louis van Gaal, very well. He was also coach of our team. We know how strong, intelligent and clever he is, and how he gets the best from his players. United are going to be one of the top clubs this year, I'm sure." Van Gaal was manager of Barcelona between 1997 and 2000 and again between 2002 and 2003. Amongst others he gave debuts to Xavi, Carles Puyol, Andres Iniesta and Victor Valdes. Was United's appointment of Van Gaal a good move? "Yes. Van Gaal did something very good by having a lot of confidence in our young players, He used them a lot. He was right because for the last 12 or 15 years those players have been the best players in our team." Josep Maria Bartomeu was speaking at the launch of FC Barcelona's partnership with globalcitizen.org and The Bill and Melinda Gates Foundation.